Fluidsys Training Centre, Bangalore conducts a long-term course on 'Professional in Pneumatics and Hydraulics - Advanced Level with TUV Rheinland Certified Qualification' Don't Miss!! A short-term course on Industrial Hydraulics – Basic Level has been completed. A short-term evening course on Electro-pneumatics/Electro-hydraulics has been completed. An evening course (6 pm to 9 pm) on Pneumatic Controls – Basic Level’ has been completed. A short-term course on ‘Electro-pneumatics – Advanced Level’ has been completed. A short-term course on ‘Design of Industrial Hydraulic Systems’ has been completed. A short-term training programme on ‘Industrial Hydraulic Systems – Basic Level’ has been completed. A training program on ‘Design of Industrial Hydraulic Systems’ is completed. A week-end training course on ‘Industrial Hydraulics – Basic Level’ has been completed. A five-day programme on ‘Industrial Hydraulics’ and ‘Maintenance and safety aspects of Pneumatic and Hydraulic Systems’ for Dagachhu Hydro Power Corporation Limited, Bhutan has been completed. 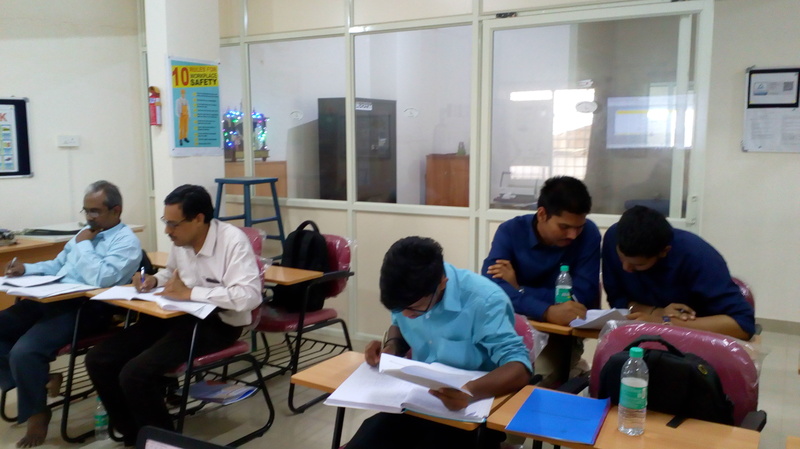 Completed a four-day programme on ‘Programmable Logic Controller (PLC) with Pneumatic Applications’. Completed a six-week training programme on ‘Professional in Pneumatics and Hydraulics – Advanced Level with TUV Rheinland Certified Qualification’. Completed a course on ‘Design of Hydraulic Systems’ for M/s Orbit Hydraulic Elevators, Guwahati. Completed a tailor-made course on ‘Advanced Electro-pneumatics’ for a multi-national company in Peenya, Bangalore. Completed training courses on ‘Pneumatics / Hydraulics / Electro-pneumatics / Electro-hydraulics’ for students from Sudan. Guided for two project works done by the mechanical engineering under-graduate students of a reputed engineering college in Bangalore. Completed two-day course on ‘Pneumatics’ for M/s Harita Seating Systems Ltd, Bangalore at client site, in collaboration with Astutix Learning, Bangalore. Completed two-day training program on ‘Piping systems for fluid power applications’ for M/s VE Commercial Vehicles Ltd, Indore at client site, in collaboration with Astutix Learning, Bangalore. Completed a training program on ‘Pneumatics and Electro-pneumatics – Basic Level’ for the Mechanical Engineering students of PES University, Bangalore. Completed a training program on ‘Advanced Pneumatics’ for the Mechanical Engineering students of PES University, Bangalore. Location: The centre is located near WIMAC Circle, Kammagondanahalli, and is 2 Km away from GANGAMMA Circle, Jalahalli West, Bangalore.